One of the favourite choices for brunch in Singapore is poached egg with hollandaise sauce. A recipe inspired by the big Aussie brekkie we had at Bib and Tucker on the seventh day. This is also something that can be easily whipped up even in a campervan Using free-range eggs, some field mushrooms, sweet potato and avocado, this version is definitely healthier. Drizzle some olive oil onto the Turkish bread. Rub the cut side of the garlic onto both the bread surface. Heat up a frying pan with a little olive oil and panfry the bread till it is golden brown on each side. Set aside. Pan-fry the mushrooms in a little oil till it is cooked through. Set aside. Peel the skin off the sweet potato and have it chopped into small cubes. Add to a hot pan with olive oil and fry the clove of garlic used for the bread, add the sweet potato cubes and cook it. Add a little water and cover the pan. Season by adding ¼ tsp of salt and freshly ground black pepper. Set aside. Prepare the avocado salsa bt chopping the avo flesh into small cubes. Deseed the tomato before chopping into small cubes. Mix together, add the chopped coriander, salt to taste, freshly ground black pepper and juice of ½ lemon. Plating can happen now. 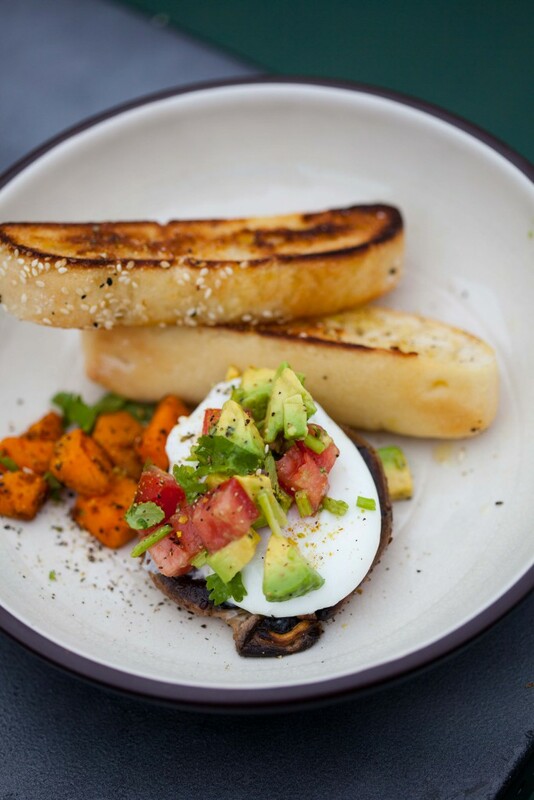 Place the Portobello onto the plate, with a slice of pan fried Turkish bread, the sweet potato hash on the side. Proceed to poach eggs. Bring a big pot of water to boil. Reduce the heat to low medium. The water should be just simmering with small bubble rising from the base of the pot. Crack the egg into a small bowl first. Slide the egg from the bowl into the centre of the whirlpool. This action will help the egg white twirl and encase the egg yolk. Time for 3 minutes. This would create a perfect semi soft yolk . Using a slotted spoon, transfer the poached egg and place onto the Portobello mushroom. During and between the cooking of eggs, skim off any foam from the water surface. Repeat with remaining eggs. 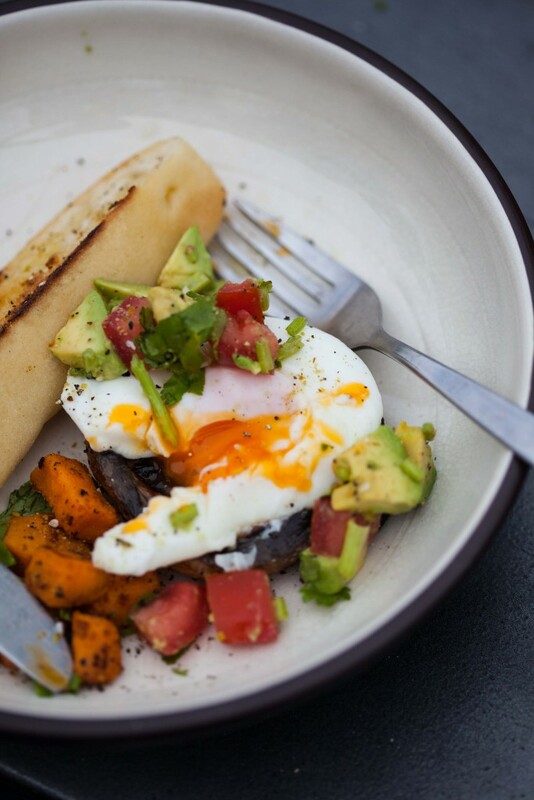 Spoon some avocado salsa over the poached egg and sprinkle with dukkah all over the sweet potato hash and the eggs. Drizzle a little olive oil over the dish and season with freshly ground black pepper. Do not add vinegar to the water used for cooking eggs. It makes the eggs sour. Using the whirlpool method and fresh eggs, the poached eggs will turn out perfect. Rubbing a clove of garlic onto the bread surface is a great way to make garlic bread without actually eating the garlic. Alternatively, you can infuse your olive oil with cloves of garlic, drizzling it on before toasting the bread. Why are the yolks from Australian chickens so orange?